A coroner has warned of the dangers of internet chatrooms at an inquest into the death of a man who jumped off Beachy Head. The inquest heard Michael Gooden had discussed killing himself in a chatroom devoted to the best ways and places to commit suicide. A coroner recorded a verdict of suicide on Mr Gooden, from Camberwell in south London, who died in June 2002. The inquest heard Mr Gooden, 35, had met a man called Louis Gillies through a chatroom called Assisted Suicide Holidays. Mr Gillies, from Glasgow, was charged with assisting a suicide but died himself in April this year. The 36-year-old was found hanged in his flat in Bank Street, Glasgow, on the day his trial at Lewes Crown Court was due to begin. The inquest, held in Eastbourne, East Sussex, on Tuesday, heard they had been corresponding since January 2002. 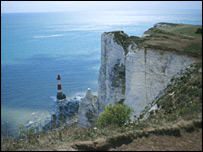 They had arranged to meet on the 500ft-high cliffs at Beachy Head, a notorious suicide spot near Eastbourne, on 5 June last year, the inquest heard. The coroner heard the pair had a meal at a hotel and then walked to the cliff edge. The inquest was told a coroner's officer was called to the cliffs on 7 June after a body was found, which was later identified as Mr Gooden. A note found in his pocket had details of an internet cafe in London on one side and on the other Mr Gillies' phone number. The inquest heard Strathclyde Police phoned East Sussex coroner's officers to say they had been contacted by Mr Gillies, who said he had been with Mr Gooden and seen him jump off Beachy Head. The inquest also heard Mr Gillies posted a coded message on the website telling other users Mr Gooden had committed suicide and praising his "determination". When Mr Gillies was found dead in his Glasgow flat in April, police found a suicide note. Coroner Alan Craze said: "Many people are becoming increasingly worried about certain aspects of the internet and particularly its chatrooms. "In many cases users are not talking to real persons but to fictionalised characters. "This provides the danger for the young, the immature, the mentally fragile and other vulnerable people." Mr Craze said the case of an internet user assisting another's suicide came on top of examples of "fraud, deception and sexual offences". He said more police resources should go into tackling internet crime.